There is a new category of computer user out there that I am discovering. I have been well aware of the uber geek that accepts nothing more than maxing out their credit cards on the top of the line peripherals and equipment, and I have been versed in the practices of the novice as well. New to me is what has been defined as “the normal person.” Until recently, I haven’t been lucky enough to meet many of these, but today I have… and they wanted a set of speakers for their computer that wouldn’t break the bank but didn’t sound like they were listening to music through a jar of peanut butter either. So, you are normal… or you know someone who is and they need speakers for their computer. What do you get? Eagle thinks they have the answer. Eagle thinks that things like 140 watts, a fancy LED on the front of the 6.5 inch Sub woofer, a remote control, and solid wood can get our engines roaring. Things like “high fidelity”, “Premium Quality”, and “Smooth Response” adorn the snazzy packaging. If you are looking for plastic speakers go click on some other review, these speakers are made the old fashioned way… WOOD! Let’s get some of the quick facts out of the way before we get to the good stuff. The speakers are not small… in fact, they are rather large. The satellite speakers measure nearly 10 inches tall and are home to two 3 inch speakers; the subwoofer stands tall at 14 and change. However, most of that space in the sub woofer is actually just… um… space; the driver is actually only 6.5 inches in diameter. The front of the sub woofer is home to a nifty little LCD screen that shows you signal response and some indication of the volume. Below the LCD screen are your manual controls for volume, menu, mute, and reset. This is where the confusing part of the sub woofer comes in. Why would you place all the manual controls for a system on a device that most people put under their desk? This is also home to the IR receiver for the remote control, meaning, you must aim the remote at the sub woofer which may be under your desk. Practice that Yoga! The satellite speakers themselves feel like miniature versions of traditional home stereo tower speakers. 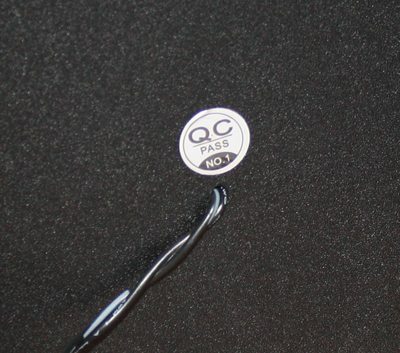 They feature fixed cords which measure a little over 4 feet long. I would prefer a bit more length but because this is a simple 2.1 system they are long enough for most desks. My single and only issue with the design of the satellite speakers is that there is no protection for the speakers themselves; they are exposed and vulnerable. Shown below, you can see how they tower over their Logitech neighbor. You can also see a mesh front covering (removable) on the Logitech Z-5500’s that keeps those curious fingers from being pushed through my new speakers. My home stereo is Denon and not the cheap stuff either, My computer speakers are Logitech’s Z-5500’s, and I have Bose headphones. While listening to music on the Eagle ET-AR508LR-BK it was difficult to discern some of the frequencies. The highs were somewhat muffled and sounded like a door needed to be opened. Middle frequencies sounded good, but when the lows hit the sub woofer, there was a decent amount of thump. However, at 79.99 they are on point or above the other’s in their class. 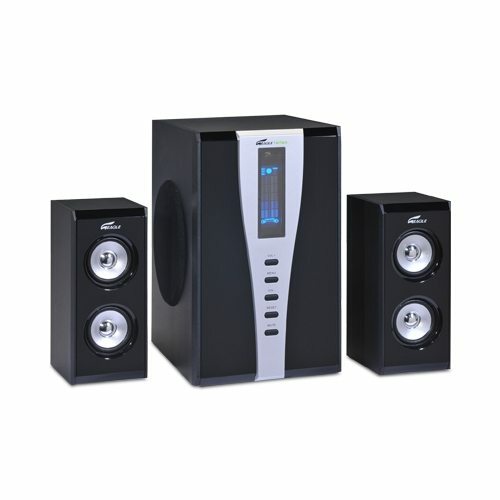 Considering the price point for these speakers, Eagle has a great showing. If you are looking for something that sounds incredible, get some Bose speakers or the Logtiech’s on the High end. 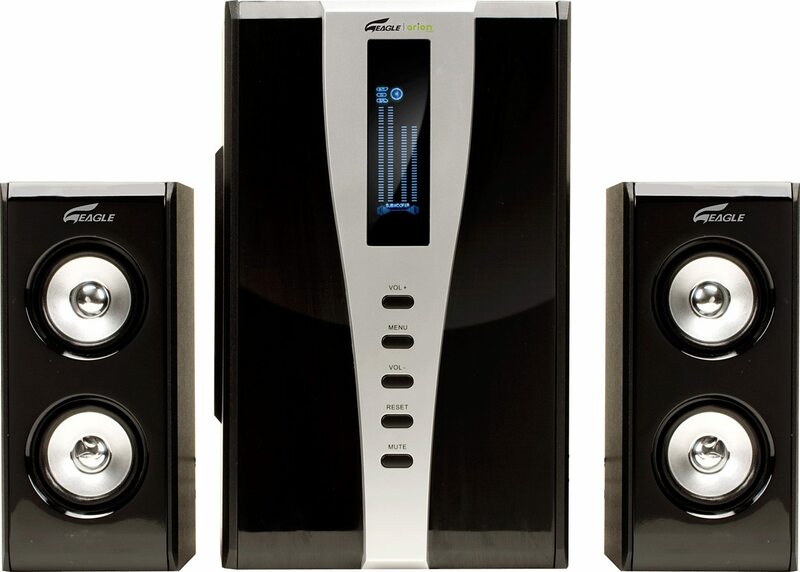 Otherwise, at 79.99 these speakers hold their own and at lower volumes compare to speakers priced twice as much. They are loud enough, but if you have the bass and the volume all the way up you will experience some serious rattle (not the good kind either). The inclusion of a remote control is a fantastic touch, however, the receiver being located on the sub woofer is a huge disadvantage. 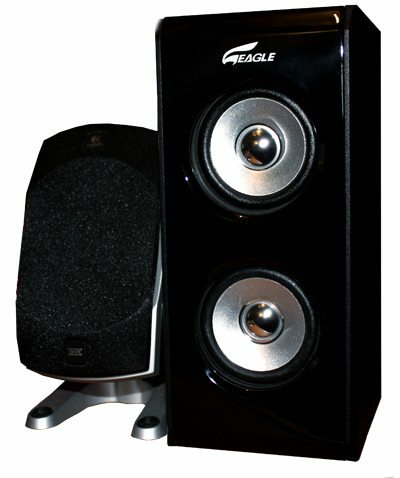 Compared to other speakers in its price class, Eagle has a winner here, but if you are used to elite sound then it is hard to remember that these are a winner in a different weight class.